Aberfeldie Jets Basketball Club has been around for almost 40 years! in the Keilor Basketball Association's junior domestic competition. We also have another 40-50 children attend our weekly Junior Jets skills clinic sessions each Term. The Club is administered by parents of players who volunteer their time either on the Committee, by coaching or participating as Team Managers. These volunteers are supported by a paid casual administrator. The Club's website is comprehensive and contains answers for most general questions. If you are unable to find the information you require please contact the admin officer or relevant registrar for further assistance. Aberfeldie Jets teams compete in the Keilor Basketball Association's (KBA) Junior Domestic competition. Teams compete in the following age groups: Under 10, Under 12, Under 14, Under 16 and U19. The domestic competition is split into separate competitions for boys and girls. Games are played from 8.00am Saturday through to the last game starting at 6.00pm Saturday evening. Age groups DO NOT have set times for games or set venues. The KBA manages some 50+ competitions with over 460+ teams playing across 21 courts at 10 different venues every Saturday. They are unable to accommodate fixture requests from players or their families. The first three rounds of each season are grading games. The KBA releases the fixture on a weekly basis for these first three rounds. Teams can change grades during the grading season. After grading is completed the KBA aims to release fixtures for the entire season as early as possible. It is best to check the fixtures each Thursday/Friday to ensure no changes have been made. Basketball is a year round sport, played over two separate seasons (Summer and Winter). The Summer season runs from October to March and the Winter season runs April to September, however games do not normally occur during the middle and last weekend of school term breaks. There is a break from mid-December through to late January. KBA Junior competitions are graded from A to E grade. Where team numbers in grades allow, a ‘reserve’ grade may be used (eg. E reserve to allow two E grades to be run). Combined grades, such as an A/B grade, may be used to allow more teams to play in a wider competition, while supporting a finals series for each grade. Please note that the age groups are set by Basketball Victoria (not Aberfeldie Jets and not the KBA). The age groups are not negotiable. Please understand that the dates differ from school years, and "playing with his/her school friends" is not always possible. While it sounds harsh that a child who is currently 8, turning 9 later this year, and 10 before the end of 2018 must play in U12s, the same rule applies for all players and they will be playing against other players born in 2008 (and some born in 2009). Birth certificates are often requested by the Club and the Association to confirm proof of age. It is the Club's preference that players play in the correct age groups according to their years of birth and not up in higher age groups, particularly in the boys space where the physicality, skills and strength difference becomes more noticeable in the U14-U19 age groups. The junior competition is comprised of over 460 teams. Game times are not guaranteed and requests for games at certain times cannot be made nor accommodated. 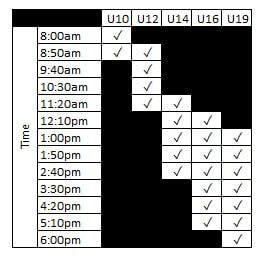 The attached matrix will provide an idea of game times for certain age groups, although sometimes they may deviate from the matrix. The Association are limited for court space and are exploring alternative court options so this list may change in future. Commencing in Winter 2019 the KBA is incorporating the door fee into the team fees. This means that there will no longer be a door entry fee to enter the stadium and pass outs will no longer be required. Accommodating training sessions for over 110 teams is a hard task, however our training coordinator does an amazing job of coordinating the Club schedule. Training days and times vary according to when our training coordinator can fit teams into our training schedule. The Club has no set day or time for a whole age group - eg. U12 B boys Team 1 may train Monday at 6.00pm, U12B boys Team 2 may train Wednesday at 4:30pm and Under 12B boys Team 3 may train Thursday at 5:30pm. The training coordinator aims to keep our younger sides training in the earlier time slots (4.30pm through to 6.30pm), whilst older sides can train up until 9:30pm. Training sessions are an hour long and training is held in local venues with a indoor court, with present training venues including; Buckley Park, Essendon Keilor College (Essendon & Niddrie campuses), Rosehill Secondary, Maribyrnong Secondary, St John's Church Essendon, Aberfeldie Primary and Essendon North Primary. Players must not to be left unattended at the training venue until the coach is present, especially important in the U10-U16 age group. After training, all children should be collected promptly. The club bears no responsibility for children left at the gym outside their designated training hours or not in the presence of their coach. Children who are not part of the team training are not permitted to train with the team unless written permission is obtained from the Aberfeldie Jets Admin Officer. There are no exceptions to this rule. The Club's Player payment and refund policy plus team selection policy can be found here. Please ensure you familiarise yourself with it before paying your fees. From Winter 2019, the KBA is not taking an entry fee at the door and is increasing fees paid by the Club. This has resulted in the Club having to increase our registration fees significantly to cover the costs. This cost is all inclusive except for uniform/merchandise. Players who play with Jets from U10-U19 typically purchase two uniforms throughout their playing career, one upon commencement and one in their mid teens. For new players, uniform costs for singlet and shorts is approximately $100. An approved Club uniform is a mandatory requirement of the KBA. Unfortunately due to the size of the Club and the logistics of issuing uniforms for our volunteer uniform coordinator we do not allow players to choose their own numbers. Optional extras like Club socks, hoodies and warm up tops are available for purchase but not mandatory. Please note that some Clubs collect weekly fees from parents each game day. Aberfeldie Jets do not do this instead we collect all fees prior to the commencement of each season to avoid cash handling on game day and the Team Manager being left out of pocket. Prompt payment is appreciated and keeps the Club running smoothly. Just like running a household, the Club has expenditures and without income in the form of fees, our bills for venue hire, insurance and the like cannot be paid. The Club has a "no pay - no play" policy to ensure every player pays on time and Club Registrars and Admin do not expend energy chasing unfinancial members. Siblings discounts apply. Players whose parent/guardian coach an Aberfeldie Jets team also receive a discount. The Club is unable to offer payment plans. Payment must be made in full before a player can take the court at training or a game. 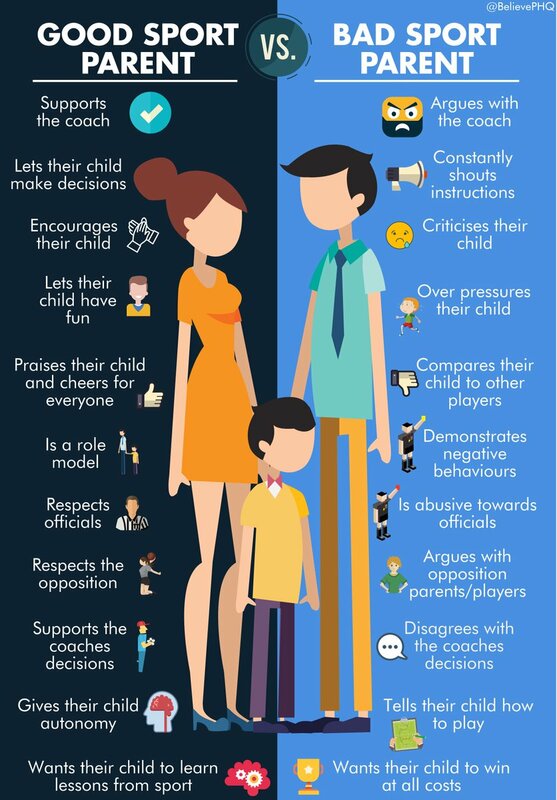 Children's sport provides a fantastic opportunity for you as a parent/guardian to spend time with your child/children. Whether you help out by coaching, being a team manager, being a great sideline cheerleader, or organizing half time snacks, the entire experience can be a positive one for your family instead of just another item on your weekly “to do” list. The Club encourages positive parental involvement and welcomes nominations for Coaches or Team Managers for those new to the Club. If you are unable to act as a positive role model, think that basketball is about abusing the referees or cannot abide by the relevant Codes of Conduct then this is not the Club nor the sport for you. We will not tolerate poor behaviour in any way, shape or form. All parents and players are expected to familiarise themselves and abide by the Aberfeldie Jets registration terms and conditions available on our information and policies page found here. Please familiarise yourself with the Codes of Conduct below and ensure adherence to them at all times, ignorance is not an excuse. Parents and spectators can also be reported for breaching the Codes of Conduct. Want to undertake a short self analysis of your own behaviour? Take this "Let Kids be Kids" online course by Play by the Rules you might be surprised by the answers. Basketball Australia's member protection by-law can be found here. Codes of conduct have been developed by Basketball Victoria to give participants guidelines to the expectations it has of them. The codes of conduct are intended to assist everyone to obtain the maximum benefit and enjoyment from their involvement in basketball. The Keilor Basketball Association and Aberfeldie Jets support and adhere to Basketball Victoria's codes and expect players, coaches, parents, spectators, officials and administrators to do the same. Parents/guardians if your child is considering transferring from another club, please register them on the wait list here AND email their details to the Aberfeldie Jets Admin Officer here. Due to high demand for places in our teams, please understand transfers cannot always be accommodated. The Association also has bylaws surrounding transferring of clearance players that must be adhered to so it is not always possible to accommodate all transfers. Parents/guardians if your child is transferring to another club, please contact the Club you wish to transfer your child to and notify them that a clearance needs to be requested. Aberfeldie Jets requires early notification that you are leaving, advising the Club during or after finals or after next seasons teams have been allocated is too late. For the Winter 2019 Season clearances requested after 11:59pm on Sunday 3 March will incur a $50 administration fee. The administration fee can be paid here. Simply complete your details via the form below and one of the Club's registrars will contact you when a new team is being formed or a position in an existing team becomes available. It is not possible to place a new player into a team immediately on most occasions as the season may have already commenced or is almost concluded or the team lists for that particular age group and/or grade are already full. In these circumstances, players will be placed on a wait list for a position in a team in the next season. Players from the wait list are then placed into suitable teams as vacancies become available or when there are sufficient children on the wait list to form a new team. The Club is always looking for Coaches to coach new teams, if you are able to coach please note this in the appropriate field on the registration form. We love positive parental involvement! The Club cannot advise exactly when your child's/children's training might be. If you know they cannot train on a particular night, please include this information in the comments section on the registration form. This link is only to be used by parents/guardians of children who wish to join the waiting list, and aren't already on the waiting list. There is no charge to join the waiting list. The Winter 2019 Season will commence on Saturday 27 April. We will start working on our teams for Winter 2018 in February/March 2019 so please put your child on the wait list by 1 March if you wish to be considered for a team. Any child on the wait list before this time will be eligible for placement into a Winter 2019 side should a space become available. If your child does not receive an offer by end of Term 1 they will remain on our wait list for any top up positions that may become available during the season. Children placed on the wait list after 1 March, will still be considered for vacancies as they arrive but need to understand they have missed cut off. To join the wait list please click here, if you use a hotmail address to sign up you will need to add donotreply@sportstg.com and @aberfeldiejets.com.au to your safe senders lists to ensure you receive emails including the automated email upon wait listing. This link is only to be used by parents/guardians of children already on the waiting list, to update their existing waiting list information. There is no charge to update the waiting list.